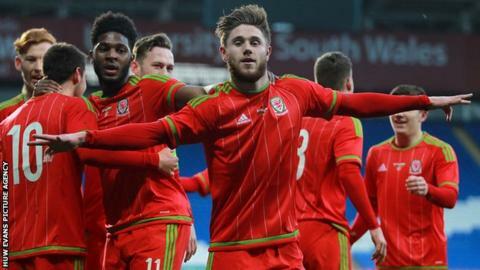 Intermediate teams manager Geraint Williams says a number of Wales Under-21 players are challenging to be part of the senior side's Euro 2016 squad. Wales boss Chris Coleman has said there are "places up for grabs" in his 23-man squad for next summer's finals. The Under-21s are top of their Euro 2017 qualifying group and Williams believes his young players should target a senior call-up. "There are places to be fought for," he said. Williams' side maintained their unbeaten record in Euro 2017 qualifying to stay top of Group five following a 1-1 draw against Romania. Of the team that faced Romania in Wrexham, winger Harry Wilson and defender Declan John have made their senior debuts under Coleman. Midfielder Lee Evans and striker Wes Burns, Wales' scorer against Romania, have been called up to the senior squad. Tom Lawrence, Adam Henley and George Williams are still eligible for the Under-21 side but featured in Wales' 3-2 friendly defeat against the Netherlands. "These players have obviously had a taste of it and they want to go to France," Williams added. "Chris is not afraid to put young players in. He's shown that when the young players went in against the Netherlands and did a fantastic job."